This version of Skript is not maintained any more (since 2014). Please download new releases from the SkriptLang fork. Updated documentation for can be found here. More resources may be found on Skript Hub and skUnity. To get an idea of what is possible with Skript consider taking a look at the scripts forum where users of this plugin share the scripts they have written themselves, improving their servers without the need for a plugin developer. Skript can also be used to replace smaller plugins, allowing you to shorten your likely long plugin list. An incomplete list of replaceable plugins can be found on the replacers forum. I'm back from my hiatus, but I will likely not be able to update Skript until I can download a recent build of CraftBukkit to fix new bugs. Also, with the future of Bukkit uncertain and no official Minecraft API in sight, I don't know how actively I'll update this plugin. player has the permission "thor"
broadcast "Fear the mighty Thor!" Furthermore Skript also features more complex script elements like loops and conditional statements, which are described in the documentation. Skript also supports variables that can persistently store information globally, per player, per block, etc., and has a wide range of expressions that you can use in conditions, effects, messages and variable names. You can always ask for help on the forums, though it can be faster for you and easier for me if you first look through the available tutorials and examples. If you get many "indentation error"s or "invalid line" errors you should read this explanation to understand what indentation is all about. If you're new to Skript you should read the basic tutorial. It explains how to write a new script step by step. In the likely case that the basic tutorial was too short you can read the more exhaustive tutorial by DemonPenguin. There are also some more official tutorials as well as user-created ones on the tutorials forum. To learn more about writing scripts please read the documentation on my website. There are also lists of all possible events, conditions, effects, expressions and types with examples for each of them. As you might already have noticed writing scripts is not very difficult. You can write (almost) normal english sentences and Skript will try to interpret them. If Skript doesn't understand something, please check your spelling and/or refer to the documentation to find out how to write your sentence to make Skript understand it. Skript can be used to define custom commands. These commands can use Skript's syntax which allows to make very user-friendly commands, like one of the most powerful /item commands available, and any other command you or others come up with. Skript also has a setting to try to interpret all unknown commands as effects. This basically allows to use any effects you can put into triggers as a command. A short introdution on how to create custom commands can be found on my website. Please note that Skript is not well suited for creating aliases of other plugins' commands or for creating a command that executes multiple other commands. I suggest to use Commander or some other plugin for this purpose. Again, using SkQuery (An addon for Skript), you can completely customize how your chat looks from prefix to suffix to player's name to the actual message itself. In addition, you can add JSON formatting to your chat in game... Want to highlight a player's name and display a location? A rank? A specific class they have selected? Want to click someones name and have kick/ban/mute/message inventory menu to appear? Easy! Triggers can be put into multiple files, and each file is treated independently. This means that you can easily use triggers made by other people by simply copy&pasting their files into the scripts directory. 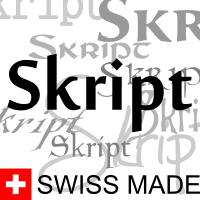 Scripts are thus like small plugins for Skript with the advantage of being able to edit them easily. You can find some scripts on the forums, and you can also post your own. Please read the Guidelines before posting a file. Aliases help to make the config more user-friendly by using comprehensive names for items and blocks, e.g. you can write 'bonemeal' instead of '351:15', or 'any hoe' instead of listing all hoe types. Aliases support data value ranges and can even consist of multiple types. You can easily define your own aliases, e.g. 'blacklisted = TNT, bedrock, obsidian, monster spawner, lava, lava bucket' and there are also many useful predefined aliases in the main config. Skript automatically logs errors in the scripts to the console, e.g. if it can't understand a line of a trigger. It will not cease operation, but simply skip the invalid parts of the scripts, be it a whole trigger (e.g. if the event is invalid) or just a single condition (e.g. if there's a typo in the condition's name). This might lead to unexpected behaviour, so always check for errors in the console after you have changed something. If you use the '/skript reload' command all errors will be sent to the player who used the command (or printed to the console if the command was used from there). Skript can detect new versions and update itself, either by a command (/skript update) or automatically when the server starts. You can turn the automatic check on or off, configure whether to check for updates only, and choose whether to download them as well in the config file. If a new version is found, all players with the permission 'skript.admin' will get notified of the new version. Want to create a message that displays after the player logs in? Sure, easy, 2 lines, done in a flash. Want to create a completely custom, unique experience that will WOW your users and astound them? Sure, it's more complex, but it's all worth it to see your users blown away by the customizability of your creations. See a user complain that something doesn't work right? Fix the code, reload the skript (Without restarting the server) and watch them be so confused as to how it was already fixed. Java developers can add their own conditions, effects and variables using a provided API. Many users have completed addons, and these addons contribute IMMENSE amounts of conditions, expressions and triggers. Some give you access to items in item frames, some let you create scoreboards, and some even let you send resource packs to players. Triggers which are executed when a player presses a specific button, steps on a predefined pressure plate, etc. This sounds awesome but will definitely take a while. Grants access to the /skript command. Allows to use effects as commands if effect commands are enabled in the config. You can also use the '<player> has/doesn't have the permission "permission.here"' condition in scripts to check whether a player has/doesn't have a certain permission. You can even create your own permissions this way, but you should note that "mypermissions. *" does not give all permission that start with "mypermissions." (The exception to this rule are other plugins' "*" permissions and any permissions starting with "skript."). To install or update Skript, download the latest Skript.jar and save it in your server's plugin directory. If you're installing Skript for the first time, start & stop your server once to generate the config files and some example scripts. Please read the changelog when updating, and create a backup of your database(s) just to play it safe. You can also download the newest aliases-english.sk and aliases-german.sk (updated to Minecraft 1.7.2). Fixed most (if not all) database issues. Please still create a backup of the old variables table just to play it safe. Part of the fix required to save and load all variables on the main server thread, i.e. performance may suffer. Added workaround to make Skript more compatible with mods that dynamically change enums via reflection. If they do this improperly Skript will still not be compatible with them however. Fixed configs only working with tabs. You can now use any indentation again, and even use different types in one file. Removed script caching completely, as it never worked anyway. This might break addons. horse variants (mules, donkeys, etc.) can now be distinguished. colours and decorations are not supported yet. Older changelog can be found in the respective files. Please don't use the comments to ask questions, report a bug or issue, or suggest a new feature, as comments can get extremely unorganized very quickly. Use the help forum instead if you have a question, the suggestions forum for feature requests, or create a ticket to submit a bug report. how I can name the item? permission message: "&4&lWarp &r&c> Nincs jogosultségod a használatára!" message "&4&lWarp &r&c> Add mega warpod nevét!" message "&4&lWarp &r&c> Már van ilyen nevű warp!" message "&e&lWarp &r&e> &6A warpod (&a%arg-1%&6) létrehozva!" message "&4&lWarp &r&c> Add meg a warp nevét!" message "&4&lWarp &r&c> Nincs ilyen warp!" permission message: "&4&lWarp &r&c> Nincs jogosultságod ahsználatára!" message "&4&lWarp &r&c> Add meg a tölrlendő warp nevét!" message "&4&lWarp &r&c> Nincs ilyen nevű warp!" message "&4&lWarp &r&c> Ha valaki más warpját törlöd jogtalanul, akár &lBAN&r&c-t is kaphatsz!" message "&4&lWarp &r&c> Warp tölörve." I can't use any of the commands. I use an older version it works but doesn't load scripts. If I have a newer version it says /skript help and if I type the same thing it gives the same thing back. Maybe because I have 1.12.2 version but I can't change it to older. It's not working. When I type on chat /skript help it say /skript help and any script does not work. It is because this is an old plugin that only uses older versions of minecraft. I use it with minecraft 1.8 and maybe can the plugin run on minecraft 1.10? It know only that it works with minecraft 1.8 and lower. Makes finding a plugin to do what you what almost pointless this thing can do anything! Was looking though plugins to make custom items like a written book that would open a menu from the BookMenu plugin(yes script can do that to!) and i couldn't find one that did what i needed or was not outdated..
and a simple script makes it all good! make player execute command "/menu open admin"
make player execute command "/menu open player"
[15:13:18] [Server thread/INFO]: Done (30.116s)! For help, type "help" or "?" [15:13:19] [Craft Scheduler Thread - 0/WARN]: Exception in thread "Craft Scheduler Thread - 0"
[15:13:20] [Skript update thread/ERROR]: #!#! [15:13:20] [Skript update thread/ERROR]: #!#! If you're developing an add-on for Skript this likely means that you have done something wrong. [15:13:20] [Skript update thread/ERROR]: #!#! and check whether this error has already been reported. [15:13:20] [Skript update thread/ERROR]: #!#! and describe what you did before it happened and/or what you think caused the error. [15:13:20] [Skript update thread/ERROR]: #!#! If you think that it's a trigger that's causing the error please post the trigger as well. [15:13:20] [Skript update thread/ERROR]: #!#! By following this guide fixing the error should be easy and done fast. [15:13:20] [Skript update thread/ERROR]: #!#! End of Error. could u help me? i want to implement a player head texture in my gui how could i do this? [03:27:36] [Server thread/ERROR]: #!#! java.lang.IllegalArgumentException: Entry cannot be longer than 16 characters! [03:27:36] [Server thread/ERROR]: #!#! End of Error. [03:27:36] [Server thread/ERROR]: #!#! If you're developing an add-on for Skript this likely means that you have done something wrong. [03:27:36] [Server thread/ERROR]: #!#! and check whether this error has already been reported. [03:27:36] [Server thread/ERROR]: #!#! and describe what you did before it happened and/or what you think caused the error. [03:27:36] [Server thread/ERROR]: #!#! If you think that it's a trigger that's causing the error please post the trigger as well. [03:27:36] [Server thread/ERROR]: #!#! By following this guide fixing the error should be easy and done fast. [19:25:10 ERROR]: #!#! [19:25:10 ERROR]: #!#! [Skript] Severe Error: [19:25:10 ERROR]: #!#! Unexpected error while checking for a new version of Skript [19:25:10 ERROR]: #!#! [19:25:10 ERROR]: #!#! If you're developing an add-on for Skript this likely means that you have done something wrong. [19:25:10 ERROR]: #!#! If you're a server admin however please go to http://dev.bukkit.org/server-mods/skript/tickets/ [19:25:10 ERROR]: #!#! and check whether this error has already been reported. [19:25:10 ERROR]: #!#! If not please create a new ticket with a meaningful title, copy & paste this whole error into it, [19:25:10 ERROR]: #!#! and describe what you did before it happened and/or what you think caused the error. [19:25:10 ERROR]: #!#! If you think that it's a trigger that's causing the error please post the trigger as well. [19:25:10 ERROR]: #!#! By following this guide fixing the error should be easy and done fast. [19:25:10 ERROR]: #!#! [19:25:10 ERROR]: #!#! Stack trace: [19:25:10 ERROR]: #!#! javax.xml.stream.XMLStreamException: ParseError at [row,col]:[1,1] Message: Premature end of file. [19:25:10 ERROR]: #!#! at com.sun.org.apache.xerces.internal.impl.XMLStreamReaderImpl.next(XMLStreamReaderImpl.java:596) [19:25:10 ERROR]: #!#! at com.sun.xml.internal.stream.XMLEventReaderImpl.nextEvent(XMLEventReaderImpl.java:83) [19:25:10 ERROR]: #!#! at ch.njol.skript.Updater.getChangelogs(Updater.java:286) [19:25:10 ERROR]: #!#! at ch.njol.skript.Updater$2.run(Updater.java:210) [19:25:10 ERROR]: #!#! at java.lang.Thread.run(Thread.java:745) [19:25:10 ERROR]: #!#! [19:25:10 ERROR]: #!#! Version Information: [19:25:10 ERROR]: #!#! Skript: 2.1.2 [19:25:10 ERROR]: #!#! Bukkit: 1.8-R0.1-SNAPSHOT [19:25:10 ERROR]: #!#! Minecraft: 1.8 [19:25:10 ERROR]: #!#! Java: 1.8.0_112 [19:25:10 ERROR]: #!#! [19:25:10 ERROR]: #!#! Running CraftBukkit: false [19:25:10 ERROR]: #!#! [19:25:10 ERROR]: #!#! Current node: databases: (config.sk, line 141) [19:25:10 ERROR]: #!#! Current item: null [19:25:10 ERROR]: #!#! [19:25:10 ERROR]: #!#! Thread: Skript update thread [19:25:10 ERROR]: #!#! [19:25:10 ERROR]: #!#! End of Error. [19:25:10 ERROR]: #!#! Update Plz and the aliases files. [16:52:47 ERROR]: Error occurred while enabling Skript v2.1.2 (Is it up to date? I'm having an error! I uninstalled and installed other versions of Skript and it continues saying the same thing in console and any of my skripts works.